The people of Ireland have voted decisively to repeal the Eighth Amendment, 35 years after it was inserted into the Constitution. Here are the results at a glance. 2,159,655 people, to be precise, turned out to vote in Ireland's referendum on the Eighth Amendment. That is 64.1% of the electorate. 1,429,981 people, or 66.4%, voted Yes. 733,632 people, or 33.6%, voted No. All but one of the constituencies voted Yes. Donegal was the only one of the 40 constituencies to vote No. The constituency with the highest % Yes vote was Dublin Bay South. The constituency with the highest percentage turnout was Wicklow, at 74.5%. The constituency with the lowest percentage turnout was Dublin Central, at 51.5%. The final result was declared by the Referendum Returning Officer Barry Ryan after 6pm this evening. The Taoiseach described today as "an historic day for Ireland" where "a quiet revolution has taken place". In a speech following the official declaration, Leo Varadkar said today Ireland "voted for the next generation". "We have voted to look reality in the eye and we did not blink." 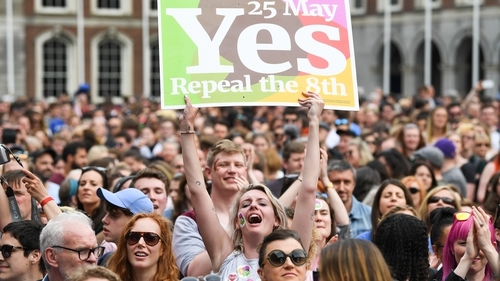 Campaigners for a No vote in the referendum on the Eighth Amendment described the decision of voters as a "tragedy of historic proportions". The Save the 8th campaign said a wrong did not become a right simply because the majority supported it. Spokesperson John McGuirk said the unborn child no longer had a right to life recognised by the State. It will take more than a week before the result of this weekend's referendum is signed by the President and the Taoiseach, writes RTÉ Political Reporter Justin McCarthy. Read his full report on what will happen in the coming days, weeks and months.